Compare Baby Safety Car Seats: Chicco, Britax (BOB), or Graco? 1. Until your infant is two years old, you should consider getting a rear-facing seat. Note that the American Academy of Pediatrics now advises parents to keep their infants and toddlers in rear-facing car seats until the age of two, or until they exceed the height or weight limit for the car seat. 2. Though infant car seats can be used with or without a car seat base, consider getting one that comes with a base. This is because if you keep the base installed in the car and simply lock the seat into it when you need to drive, it is more likely to have a safe and correct installation of the seat every single time. Without the base, you'd have to safely and correctly install the seat every time you put it into the vehicle, and chances are you will not always do a perfectly secured job. You should also make sure that the base is easily adjustable so that correct positioning of the base in the car that will ensure safety and comfort of the infant can be readily achieved. 3. You should consider a car seat with at least 5 point security harness, side impact protection, and appropriate safety inserts for newborns or very small babies. 4. You should consider getting a car seat that is compatible with one or more stroller brands and models. It should in particular have a simple, one-step, click-and-go type installation mechanism to the stroller of your choice, allowing you to create a travel system that best fits your lifestyle. 5. You should make sure the car seat is aircraft travel certified just in case you may need to travel with your child in the future. 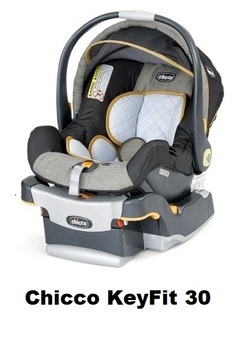 The baby safety car seats selected for comparison in this article, Chicco KeyFit 30, Britax (BOB) B-Safe 35 and Graco SnugRide Click Connect 35, all satisfy the above five requirements. These were also the most popular in their product category among Amazon customers at the time this article was written and had received excellent reviews from most Amazon buyers. 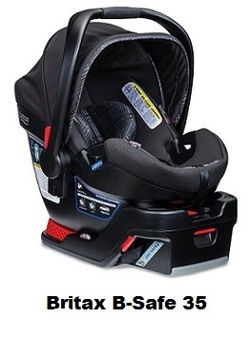 Note that in 2011 Britax acquired BOB, a manufacturer of premium car seats, strollers, baby carriers and accessories. Therefore, in this article, the brand names Britax and BOB refer to the same company. All three brands include one base in the purchase of the car seat, but if you have multiple cars, additional bases can also be purchased so you don’t have to move the base from one car to the other (please refer to the Amazon products section below for additional bases). As mentioned above, even though the car seat can be installed without a base, it is strongly recommended to use the base. This is because if you keep the base installed in the car and simply lock the seat into it when you need to drive, it is more likely to have a safe and correct installation of the seat every single time you do it. Without the base, you'd have to safely and correctly install the seat every time you put it into the vehicle, and chances are you will not always do a perfectly secured job. Side Impact Protection distributes crash forces, shields from vehicle intrusion, and contains the head and body during a crush. All three car seats considered here are lined with energy-absorbing foam for improved side-impact protection and comfort. All three car seats considered here come with some sort of insert that protects the baby and in particular baby's head when the infant is a newborn or too small, but only Chicco refers to it officially as removable newborn insert and recommends that it should be used for babies 4-11 lbs. Britax B-Safe and Graco SnugRide refer to their insert respectively as a pillow and a head support which are both removable as the baby gets older. A tangle-free, 5-point harness distributes crash forces across the strongest parts of the body and provides a secure fit. All three car seats considered here come with a harness. All three car seats have an adjustable base. Chicco KeyFit 30 car seat is compatible with the Chicco Bravo, Urban, Activ3, Neuvo, Liteway Plus, Cortina, Cortina Magic and Cortina Together Strollers. It can also be used with non-Chicco strollers as long as a stroller adapter is obtained. Britax has stroller compatible design: the integrated CLICK & GO adapter system works with BRITAX B-Series strollers. Graco Click Connect technology offers a one-step secure attachment to all Graco Click Connect strollers to create a travel system that can be customized to your needs. Please refer to the Amazon products section below, for specific stroller recommendation for each of the three car seats considered here. When you remove these three car seats from their base, they can be placed on the floor and rocked. This is a great feature to put the baby to sleep. When you click the car seat image in the Amazon product section below, you will be offered all the available colors to choose from. Amazon user ratings are provided by customers who have bought and reviewed these car seats. The maximum rating is 5 stars. The prices shown are the listed prices that were in effect at the time this article was written and may have changed. To see exact price information, please refer to the Amazon products section below. Note that Amazon often provides a discount to the list prices of sold products. If there is a discount, both the list price and the exact price will be shown when you click the product link images in the Amazon section below. Please click the baby car seat of your choice below for price information or to purchase. A color choice will be offered on the right of your screen when multiple colors are available. Amazon often provides a good discount on the List Price of sold products. If a discount is available, the List Price and the actual Amazon price will be shown when you click the links shown below. NOTE: For each of the three infant safety car seats, we have also provided below Amazon links for the best compatible stroller and additional base if needed.